All around the country, the end of the school year is here. And to most children, that means only one thing: summer vacation. The normal routine is broken up for two and a half glorious months of sleeping in, summer camps, family trips, play dates with friends, or whatever unique joys summer vacation brings to a child’s life. This regular break from regularity is a wonderful thing, but often children can see it as a break from everything they normally do, including the practice and growth of their Catholic Faith. Many parish ministries and religious education programs “go dark” for the summer, and of course, if a child is in Catholic school, that regular connection with the Faith is dormant for the summer months. As parents, though, we don’t want our children to take a break from their Faith during the summer. We don’t want them to take nearly 25% of every year to stop praying, learning, or growing closer to God. But we may find ourselves more on our own, without as much help from the school or parish during the summer. Thankfully, Catholic Brain does not go dark for the summer; the following are some ideas of how it can help. The break in routine during the summer gives the opportunity for some special religious opportunities. We can take our children to visit local shrines, participate more in service projects, or even make a pilgrimage. But in order to help our children continue to make the Faith an integral part of their daily lives, many people find making some summer routine helpful. One simple thing to do is make use of the daily Scripture presentations from Catholic Brain. Each morning children can start their day by reading a child-friendly translation of the day’s readings at Mass, followed by a simple five-question quiz. This allows them to join the mind of the Church in pondering God’s Word throughout the summer. The saints are our constant companions throughout our journey in life. Each day children can learn about the Saint of the Day. This way, throughout the summer, they will be able to make many new heavenly friends. In the morning, at meals, and before bed, children can be encouraged to ask that day’s saint to pray for them. By incorporating the daily Scripture readings and saints, the Catholic Faith can continue to be part of the rhythm of our children’s daily lives. One of the things that many children spend more time doing in the summer is watching television. Catholic Brain has many wonderful videos for children, about the life of Jesus or other Bible stories, about the saints or virtues. If children will have more screen time this summer, perhaps it can begin with one of the videos found on the site. Have them share with you what they learn each day. Of course, there are all sorts of things that can be found on Catholic Brain, from games and other activities, to printables and music. The extra time this summer gives children an opportunity to search the site on their own and find things that interest them. One of the best opportunities Catholic Brain is offering this summer is its eight-week Summer Catechism Study Program, beginning June 18, and running through August 10. This child-friendly approach to the truths of our Faith is built to become part of daily life. The 38 videos correspond to the 38 lessons in the Baltimore Catechism, and are accompanied by activities, games and quizzes. Children can track their progress by earning badges throughout the program and each child will earn a certificate of completion when they finish. They will also take a final quiz, and those with the highest scores can win Catholic Brain store gift cards, trophies, and free Biblezon tablets. Best of all, the program allows kids to end the summer with a deeper understanding of the Faith than they began it with. Just go to the Catholic Brain site, and click on the pink “Summer Catechism Study Program” tab to sign up! 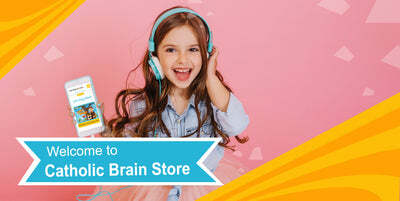 Visit Catholic Brain Store Now! Error! An error occurred while submitting the form. Please try again later or contact us.